SKINCARE REVIEW. THE FAB FIVE. | Life Looks Perfect. SKINCARE REVIEW. THE FAB FIVE. January has got to be one of the slowest, challenging and depressing months of the year. Going back to work was tough, attempting to keep my anxiety at bay and the chilly weather has certainly got me feeling the January blues. However lovelies, my skin has never been in better shape! Whether this is through my regular skincare ritual or the fact that I have been listen to what my skin needs, who knows but it's looking goooood. So to today's post, my fab five. 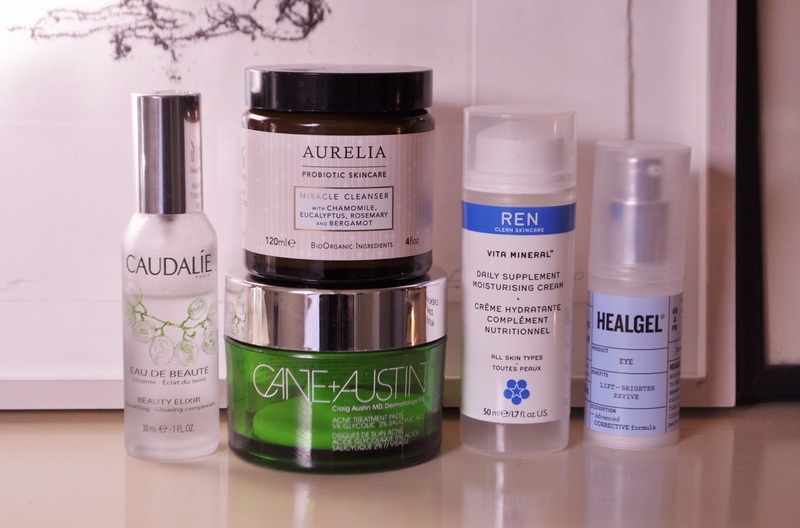 Of course they are skincare heroes and together make one mighty fabulous routine. First up is the cleanser. I am sure if your on a spending ban, you have already fled from this blog post, as this Aurelia Miracle Cleanser c/o is the ultimate luxury. I have had the pleasure of owning this cleanser for a few months now and I have to say peeps, it is a dream to use. It's formula and texture is a cooling, rich cream cleanser that literally melts away your makeup. It is perfect for removing eye makeup, although I don't use waterproof mascara so you would have to test that one out for me ladies. Since popping this cleanser into my daily routine, mainly in the evenings for a late night pamper, my skin is looking healthy, bright and hydrated. For me I particularly love Aurelia's choice of delicate and beautiful essential oils, such as Rosemary, Eucalyptus and Chamomile that definitely help sooth the skin and calm the mind. Next step, my exfoliating toner. Since my Pixi Glow Tonic seemed to have made its way to the back of the beauty shelf, as to be honest it has stopped doing anything for my skin, I was lucky enough to be gifted Cane and Austin Acne pads c/o by a wonderful lady who has joined the TDL team in America. Not really sure of how to use them or even slot them into my routine, I had to ask the lady who knows all, Caroline Hirons. She said to use them as a 1st tone, which I am assuming is due to their exfoliating ingredients and high percentage of acids. I don't use these pads everyday but when I do use them they give my skin a slight tingle. This is completely natural don't panic. They have really helped keep spots at bay apart from those random under the skin evils that pop up now and again but I just can't magically get rid of them despite all my attempts. But my chin and nose have hardly had any breakouts and I think my skin looks really healthy and smooth. These treatment pads are the only known acne product that you can buy in stores with the same amount of salicylic and glycolic acids, so I would certainly introduce them into your routine slowly if your not used to a high percentage of acid on your skin. My thoughts are the more acid the better! Beauty in a bottle, well this might just be it! Late into 2013 Caudalie Beauty Elixir made its way into my Space NK basket and to be honest it was the best random purchase I have ever made. Not really knowing what to do with it or if I would even like it, I took the risk. I think my first thought is I can see why this is a cult beauty product. It is not only great for keeping your skin looking radiant and feeling refreshed it has actually helped keep spots at bay. I have been using this product a few times every week when I am feeling a little tired or blue. The mist feels so cooling in the morning, which along with its predominant plant based ingredients such as Grape, Rose and Mint, the scent revives me back to life! This will now and forever be a staple on my beauty shelf. Dragging myself out of bed in Winter is a chore. Since the Christmas holidays, I have lost my early bird ways and become a hermit wrapped in a giant marshmallow of a bed that never wants to see day light. Sometimes my skincare routine is the only way of waking myself up. Healgel for Eyes c/o has become a must have for these sorts of mornings, as its soothing light gel is perfect for a quick eye pick me up. One problem I have suffered with quite often is puffy eyes in the mornings, which is usually made worse when I haven't slept well. I always grab this eye gel for days like this, as it not only helps brighten my eyes but cools the delicate skin around my lids too. I am a big fan of this newbie on my shelf and can't wait to try more from Healgel's skincare range. My final fab five must have is a new one from REN that I picked up just before Christmas after running out of all my moisturisers. Taking risk on this product, which I hadn't previously sampled, I knew that I could trust REN. After a month of using REN's Vita Mineral Moisturiser, I love it. It's a thick and rich cream that doesn't feel too heavy on my skin but instead hydrates and smooths the skins surface. The texture of the cream I think is perfect for wintry weather like we are having at the moment. The moisturiser has been my go to moisturiser for day time and along with my fab foresome above, my skin has been radiant. Just what I have always wanted! For a simple, nasty free product, I couldn't be any happier. Thank you REN! Added these to your wish lists Ladies and Gents? I know I couldn't recommend them enough. Next up on Friday expect five nail favourites from 2013. Till then.. I recently picked up the Caudalie Beauty Elixir and I can see why most people love it! It's beauty bliss isn't it! I love it when I am feeling a tad lazy or tired, really wakes me up :) Thanks for following!